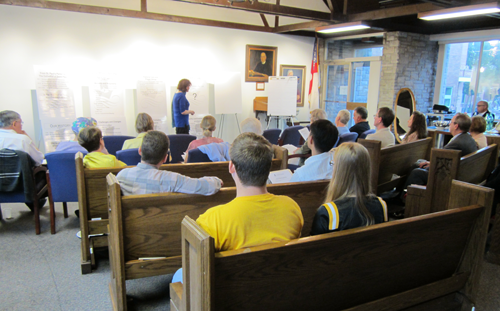 From a tactical perspective it is significant that members from the congregation conduct the focus groups. There is no substitute for the powerful message delivered when a member of the congregation addresses fellow members about the needs and opportunities for THEIR church. It is the cornerstone from which support for and ownership of a campaign is built. Preparing congregants to conduct focus group meetings, therefore, is an essential element in the Readiness Assessment process. There are two segments in the preparation process: 1) Presentation Delivery; and 2) Q & A comment session. Preparing for the presentation is where most people naturally gravitate when called upon to conduct a focus group. Obviously, a good presentation depends on a well prepared case for a campaign, easily understood materials and an articulate reciting of the case. Just as important, however, are the comments attendees will offer in response. Leading the post-presentation discussion generates the rich dialogue so critical in determining a potential campaign’s feasibility. To prepare presenters for leading a facilitated discussion, James D. Klote & Associates has put together a training program built on several fundamental tactics used by professional facilitators to generate lively, rich and robust post-presentation discussions. Listed briefly, below, are several of the tactics used to keep a discussion moving, engage all attendees in the discussion and cover the several topics critical to gauging a campaign’s viability. Probing: is asking a speaker to elaborate on a particular point or to expand the comment to include related sub-topics or requirements. This technique can also be used to ask another attendee to expand on the speakers comment. This is among the most fundamental interviewing techniques. The Handoff: starts by asking the group (often by a show of hands) if they agree/disagree with a statement. Then ask someone who responded, Why? Reflective Listening: Is a summarization of the statement/question just offered by an attendee in the words of the facilitator. Ask the person who made the statement if it is accurate; the person will inevitably elaborate further. From here Handoff the response to another attendee. Silence: when used appropriately is among the most powerful tools the facilitator has to use. So remain quiet until someone becomes so uncomfortable with the silence that they break it with a comment. As a facilitator, be comfortable with the silence so that someone else fills the void. ‘The Flip’: Is used in response to a question, usually of the hypothetical nature. When the attendee asks a question, return it by asking how they would answer. This is effective in response to the ‘Why?’ question. This technique can be used to push a question to the other attendees, as well. Redirect: allows the facilitator to move the discussion to another topic. Simply suggest that there are other items to discuss and then offer a question or opinion about another aspect of the presentation. Devil’s Advocate: Might be the most fun of all the techniques. Offer an unpopular reaction to a comment as a way to explore the topic more deeply. Or ask if anyone would like to take the Devil’s Advocate position on a topic or comment. Using these simple techniques can ensure that everyone in the meeting is given the chance to participate. They help the facilitator cover all the topics brought up during the presentation. And they generate a discussion that provides the information input so necessary to a comprehensive Readiness Assessment with the added benefit of a member leading the discussion.